Margaret is from Los Angeles, but really she's from Pasadena (it's like a 20 minute drive without traffic). 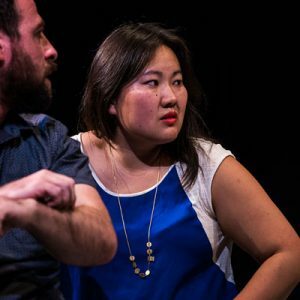 She completed the Upright Citizen Brigade’s improv curriculum in 2011 and was accepted to their Advanced Study program in October of the same year. Margaret has had the privilege of studying under Joe Wengert, Eugene Cordero, and Rebecca Drysdale, among others. Her go-to improv move is hugging. Margaret loves many things in this world (most of those things are food or restaurants). Margaret has taken a lot of selfies with her friends’ animals. Margaret is always down for a quality porch hang, listening to soul music and sippin’ on ginger ale. She spends her spare time baking, embroidering, and looking up other ways to be as much of a grandma as possible. I am a beautiful animal, I am a destroyer of worlds. Margaret would really love for you to be obsessed with her as an improv teacher, but in like, a super chill way. Really, though, she wants you to love improv as much as she does. Her improv philosophy is always evolving, but it usually boils down to listening and reacting in a true way. She’ll do her best to help you do that. If that’s something you’re into. No pressure. She’s totally cool with all of your decisions. She’s never actually taken a WIT class, but consider trusting her anyway. Margaret completed her improvisational training at the Upright Citizens Brigade, Los Angeles in 2011 and was accepted to their Advanced Study program in October of the same year. Past instructors include Joe Wengert, Kevin Mullaney, Rebecca Drysdale, and Eugene Cordero. She has goofed regularly with the WIT ensemble Love Onion since April 2015.